Since Davey started business in 1934, we have developed astrong association with the rural customer. 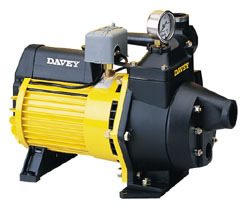 Davey have been manufacturing and supplying reliable pumps and pressure systems for the man on the land ever since. From the outset we at Davey knew our products needed to be tough enough to withstand harsh Australian conditions in all their extremes. It’s little wonder then that Davey customers around the world have come to depend on Davey for reliable rural water supply systems. The Davey range of quality Australian-made deep well pumps and pressure systems is ideal for supplying high pressure water from suction lifts beyond 7.5 metres. By submerging the jet and venturi down the bore, flows can be provided from as deep as 50 metres. Deep well systems can also be installed in horizontally off-set situations to draw water from distant dams, rivers etc. This allows the pump to be mounted away from the source of water to gain access to power, or in places where there is the possibility of flooding. The Davey range of quality Australian-made shallow well pumps and pressure systems is ideal for supplying high-pressure water from bores, rivers and dams to applications ranging from garden sprinklers through to stock watering and wash-down applications. Shallow well pumps offer versatility of performance. Simply by changing the jet and venturi, the performance of the pump can be altered to compensate for alterations to pipework systems, trough elevations, or other specific needs.